When I get a call about our geriatric care management services, most people are not asking for a geriatric care manager, per se. They are asking a question about something they have noticed or been told about their older parent or loved one. The question most often is about a change in the older parent that sets off the caregiver alarm that something is just not quite right. In this posting I am going to go through some of the questions I hear and then explore some of them in more detail in later blogs. Please also let me know any questions you may have or any telltale signs you may have seen in an older loved one that give you concern. Change in eating habits: Have you noticed that your loved one’s clothes are fitting more loosely, that they miss meals or that they just don’t have the appetite they used to? Losing interest in food or eating significantly less are not normal or inevitable parts of aging. But older stomachs do empty more slowly than a younger adult’s, and food may be less appealing because the sense of smell and taste are diminished. Yet, the fact remains that malnutrition is a serious health threat to an older adult. “There’s a fair amount of evidence that suggests if you lose appetite as an older person, in the next six months, you’ll have a higher chance of dying.” This is according to Dr. John Morley, professor at the medical school and Director of Geriatrics at Saint Louis University Hospital. The cause may not be directly tied to food losing its appeal, per se. It may be that your older loved one simply has poor fitting dentures that just take the joy out of eating; it is actually painful. 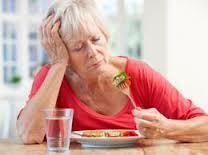 Loss of appetite is also potentially a sign of depression among older adults. Older adults also have had a lifetime of losses, such as retirement, debilitating chronic disease, death of a close family member or simply not being as socially engaged as they once were. And these losses can become a huge emotional burden that detracts from appetite. Any of these causes that lead to a diminished appetite can also ultimately lead to malnutrition which is a slippery slope. Malnourishment can lead to a reduced immune system and the ability of the body to resist diseases or other assaults. Small cuts or bruises will be slower to heal or even be more prone to infection in a malnourished older adult. As the malnourished body looks for nutrition it will feed upon itself, particular muscle. Once an older adult’s muscle mass is diminished they will, in turn, be more susceptible to falls or even degradation of bone mass and fractures. And it is hard to put the healthy weight back on. So, when next you visit the older adult in your life or have a meal with them, take note of the food they consume and what gets left on the plate or not served. Also, check their refrigerator if they are living independently. Look for how well-stocked it is, signs of food well beyond expiration dates or spoiling. It is not just about eating a full meal as much as fueling a healthy, older body.